Finished the second drying mat. Now I need to make two reversable clean/dirty Hanging signs for their dishwashers. I finished off the blanket for the first baby doll donation carrier today so I'm starting on the Valentine package for a family member's baby girl. For some reason I cannot get two bunny ears to come out the same size. It is just that kind of day. The cold is brutal and supposed to be worse tomorrow. I keep thinking thaw. Mary Jo - so glad he liked the ghan! People don't realize how much work goes into these. Next one will you use HDC stitch to make it bigger? Next time I will add about 50 stitches on each side and maybe 20 on top and bottom. Don't know if I told you or not, but the graph was courtesy of Free Graphs on FB. That is one very cool site and they will make graphs for you, if you have the picture. Mona...thank you for the suggestion and I'm so sorry it's taken me this long to respond!! I have a question though...I just looked at the site you mentioned and it looks like a regular weather info type site...how do you get the temps for every day of a specific year in a specific zip code? 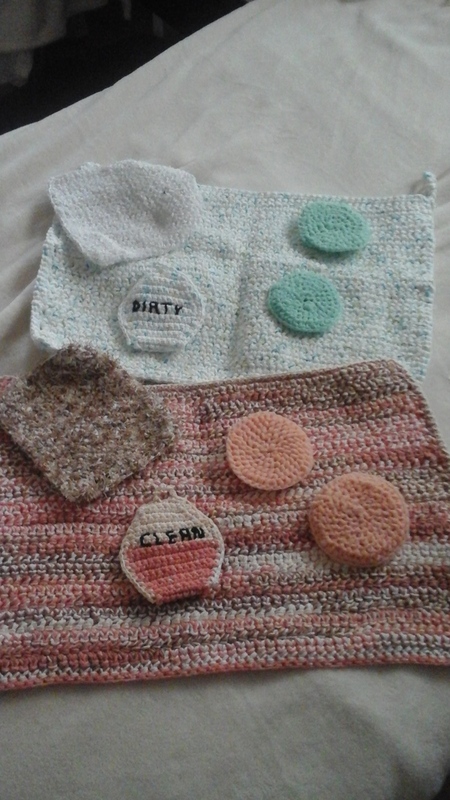 If I can get the info for the fourth blanket, I'll be able to start on these for my girls! I've been snow bound this week (which you'd think I'd avoid in NC, but apparently not lol). I made a bunch more hot pads and took the old ones and gave them to my two youngest. They got a toy kitchen for Christmas so they are having a blast using the hot pads there. I've got the first 70 rows of the baby Hogwarts blanket done! There are 290 rows total, but I set myself a goal of 10 rows per night and so far I've been able to stick to it. I'll try and get a picture of the work so far soon. One of my dear friends at church has unfortunately lost 4 pregnancies (that I am aware of) over the past 3 years. It has really triggered deep soul searching and digging into her faith to get through each loss. I asked her before Christmas if I could make her something. I've lost 2 pregnancies myself so I have an idea of what she's going through, but I have my 4 beautiful daughters to ease my heart. I told her that I make something for every baby born to a family I know at our church, and I would really like to make something for her, if she would be ok with it. I told her if it would upset her, I'd rather she said no & I wouldn't be upset if she did, but I truly just want to give her something to hold on to when she needs a reminder of the promises God has made to us. She thanked me and said I could make her something, so yesterday I started a Bavarian stitch baby blanket that will ultimately have 10 colors in it for her rainbow baby (a baby born after miscarriage or still birth is called a rainbow baby)...I'll give it to her when I get it finished, probably next week. We're going to try and get through the roads that lead to the main roads around here to get out of the house and to church in the morning. I know our street and the one we're off of are still a mess, but from posts of local friends on Facebook, it seems like the main roads are fairly clear now. Really hoping we can get out for a while. I adore my family, but I really could just use a little time NOT in our house together lol. It's basically been two full weeks of family togetherness, which is wonderful but I do crave just like 10 minutes......wish us luck tomorrow!! Luck on the getting out. I do not miss the snow one bit. Sorry to hear about your friend. I am back to working on dolls. I am making another from the book and it is going to be fun. On the main page put your town in "search locations". It will come up on the "today" tab. The last tab in that line is "history". Click on that and from the history page you can pick month, day, and year. It was so nice of you to reach out to that lady in that way. Many times people feel uncomfortable talking to people about losses so they just avoid it. I am sure it really meant a lot to her and I can't wait to see what the blanket looks like! Hi everyone!! We ended up staying home this morning because the roads we so slick...I'm nearly finished with my rainbow baby blanket, and I've done my 10 rows on the baby Hogwarts blanket tonight. 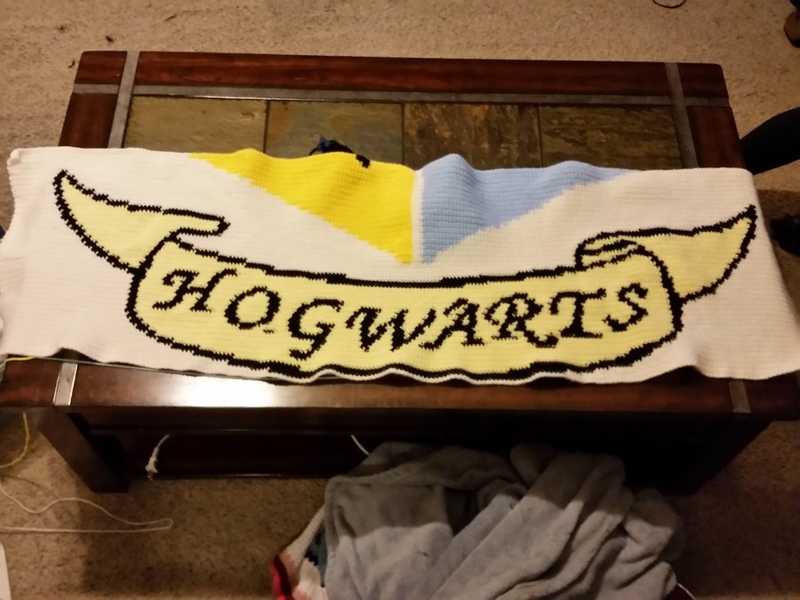 Unfortunately I realized I've made a pretty obvious goof on the Hogwarts blanket. Any suggestions on a fix are very welcome....if you look at the bottom of the banner, between the O and the G, you'll see a short black line. It's 3 sc in the wrong color. Obviously I don't want to undo all the work I've done since then to change the yarn on those 3 sc, but I'd like to cover it or something...suggestions??? 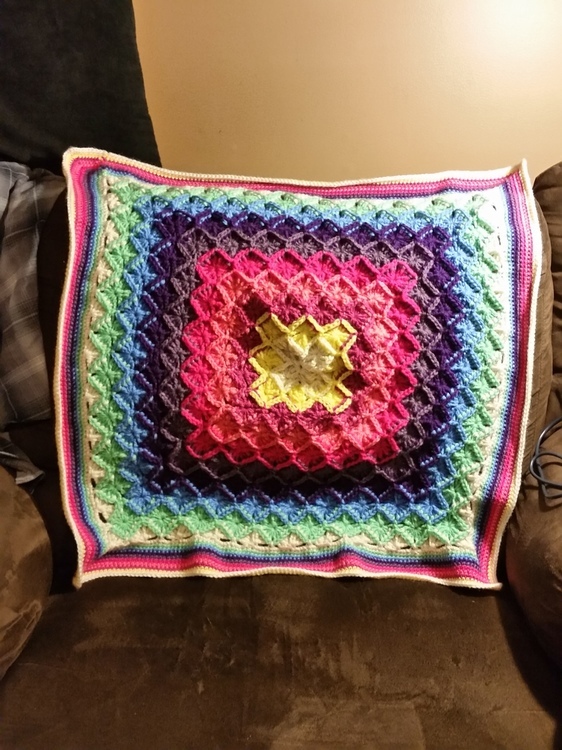 It is frustrating when we make those little mistakes, but it is an awesome blanket. Hopefully someone can suggest something. I've got the bunny made for my Valentine's lovey blankie. I need to make its hands and the heart I want to add to the blanket. I'm almost finished with the blanket itself. Then I'll just have to assemble it. I'm still settling on what else to include in the packages and I have to order the Valentine's board books to go with it. Tonight is my night for pictures I guess...I just finished the Bavarian rainbow baby blanket for my friend at church...it's all done in Vanna's Choice and I used (from the center) fisherman, lemon, raspberry, pink grapefruit, shocking rose, dusty purple, eggplant, sky blue, and pistashio. Less than a full skein of each. I repeated the colors in reverse order for the border. I'll be giving it to her the next time I see her at church! Thank you. I gave it to him yesterday and he said he liked it. He was going to put it on his couch. Guys do not gush and I rarely see his wife, as she still works. If I every make another one, I know how I can make it bigger. Judianne, I am not a baseball fan, so I only watch it, if any team (Phillies or Tampa) are in the series. How big was that blanket?. Talking about guys " they do not gush". I guess my next door neighbor is different than other guys. Each time I crochet something for his kids he is sooo interested.. and sooo amazed...He just loves everything LOL. And he always makes sure to tell me how much he and his family really appreciate that I am making that stuff for his kids. His wife is very appreciative and thankful too. But as for him, he is just going "wild" about my crocheting. Sometimes I think that any moment now (when I am there) he will probably ask me to teach him to crochet LOL. He is a young guy, probably in his late 30's. He even started snow-blowing my driveway I guess because of that. I use to have a kids from from different neighbors taking care of that snow, I was paying them. Last year they started "goofing of", I was left with snow on my driveway & my sidewalk. That new next door neighbor took over that job with out asking me. He dos not want to be pay for that either. That is a big driveway.. The Bavarian baby blanket is adorable. Sorry I can't help you, I would try and decide if it is that bad, or rip it out. It depends on how bad it annoys me. You are doing a great job on it. I have see it done and it is one beautiful afghan. The mistake on the hogwarts blanket doesnt bother me enough to want to see it redone. If it bothers you cross stich over those three squares in yellow. Some cultures deliberately make a "mistake" in their workmanship to symbolize that they are not perfect. And therefore temper their arrogance. Yes! I heard about some Native American tribes who do that to keep from angering their God' way back when I was in grade school so little goofs generally don't upset me. It's just such a different color there, it's noticable. I think I'm going to try & stitch over it. My Irish Mother always had a mistake in whatever she made. She always said that when you make something a little of your soul was in the item. The mistake gives it an escape. Can I say my Mom was very superstitious. Finished two kitchen sets. I might add plastic bag holders. Jessie, I've woven in a color tongues mistakes in my graph ghans. With a light touch and a tapestry needle you can hide most of it and weave in the ends of the new thread on the wrong side. Like I said, I've done it too! Typing on kindle fire....what a bear! Mary Jo, I never need to add a mistake on purpose....there are always a few to pick from! I don’t think it looks bad at all. However, a mistake in knitting can be covered by embroidering a similar stitch over it with the correct color. Wonder if that would work for crochet as well?